APTricks president Aaron Paterson founded the company in 2005 when he released one of his most closely guarded secrets to the magic world: Icarus Effect. Aaron felt that the only way to get credit for his original ideas was to market them to his fellow magicians. Hence APTricks was born! With an online store, APTricks has developed a client base that spans the globe and are proud to be continuously adding satisfied customers to their database. The mandate for APTricks is to release quality products that magicians will use and be satisfied with. Quality over quantity! 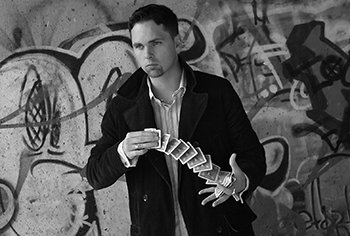 Aaron says: “If we can release one really great magic effect per year, then I am happy.” This makes sense given that a lot of Aaron Paterson’s time is devoted to his career as a full time professional magician/illusionist. Suffice it to say Aaron Paterson knows what works in front of an audience through years of performing and consulting for corporations, resorts, theatres, casinos, hotels, fairs, television commercials/programs and in almost every other venue available to a magician. This gives him the advantage of being able to test material on the paying public before releasing it to magicians. Any effects released by APTricks are guaranteed to have been honed and perfected in front of a live audience for maximum impact. APTricks first release, Icarus Effect, has revolutionized self-levitation in the world of magic and is currently being featured by some of the top magicians on the planet. Icarus Effect has appeared on international television and has become the standard to which all other live self-levitations are judged. Aaron Paterson would like to thank his many friends and influences inside and outside of the magic world who have imparted their knowledge and wisdom and who have helped shape, guide, inspire and motivate him to strive beyond the impossible. It is to these people that Aaron remains eternally grateful. For details on Aaron Paterson as a Corporate Entertainer, please see Corporate Entertainment Toronto.